A decision by a council in Essex to ban hanging baskets from lampposts has been called "health and safety gone mad". Essex County Council has said floral displays cannot be attached to lampposts in the Tendring area until they have been "structurally assessed". The council wants to ensure hanging baskets pose no risk to the public. 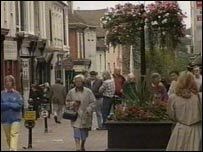 In Bury St Edmunds, Suffolk, displays were temporarily banned in 2004 for safety reasons until new stands were put in place. Pierre Oxley, a Tendring district councillor, said: "It's a complete and utter joke and health and safety gone mad. "This sort of thing gives local government a bad name. "People can't understand it. We've never had a hanging basket fall down before." A spokeswoman for Essex County Council said it was aware of 14 lampposts in the district that were not strong enough to have baskets attached to them. She added: "Some lampposts are made of materials unsuitable to take the weight of hanging baskets and others that may be suitable need to be structurally assessed before any load is attached to them. "This is not a new policy and it is to protect members of the public and public property. "We hope that as soon as the other structures have been verified the people of Tendring can enjoy their hanging baskets throughout the summer."